Recently, I wrote about the importance of parents, teachers, and teacher librarians supporting student choice in reading. As a teacher librarian, a former secondary English teacher, and a parent of two elementary school students, I often experience up close how complicated it can be to teach students to make their own reading choices. Struggling or reluctant readers, especially, need the support of reading mentors to help them find the right book. These readers often make poor choices when selecting books, tending to choose books that are too hard (Gambrell, 2011). All students want current, diverse materials from which to choose, and they need support from experienced readers to help them know how to make their own choices. One way we prepare our readers for informed citizenship is by teaching them how to select books for themselves and to respect the choices that other readers make. The freedom to read means that students and their parents have the right to make their own choices about which books meet their individual and family needs. The American Library Association details this democratic principle and the library’s role in upholding it in their Freedom to Read Statement, and they also recognize that school libraries are a particularly important and complex setting for considering intellectual freedom issues. In my work as a teacher librarian, I encounter tough choices every day, and I try to be transparent with my students and families about how and why I’ve chosen to include certain books in the collection. Above all, I strive to teach students how to make their own reading choices, and I support parents in their right to guide their own child’s selection. The library is a resource for everyone in the school, and part of learning to read means learning to choose—and to respect each others’ rights to choose their books. As a parent of a ten-year-old daughter and a six-year-old son, I know exactly how complicated these choices can be. Recently, my daughter brought up how uncomfortable she is with the “bad words” she has run across when reading a new fantasy series (a series, by the way, which I bought her as a gift because the professional reviews I read convinced me it was of good literary merit for children’s literature and would be at her reading and maturity level). I was so glad she told me about the language and how she felt, and we talked about why the words were used and whether she thought they were realistic or just for shock value. I told her she can put the books down if she wants, or she can skip over the words and just remind herself that some people use language that she doesn’t like. She chose the latter, and she went on to devour a quality three-book series. I worry about how much more complicated these questions and tensions will become as my kids get older, and I worry that my daughter will go dark when she enters the teenage years, ending conversations about books altogether. Several of my most avid adolescent readers recently told me that they don’t tell their parents if they think their parents would be upset by topics or language in a book. 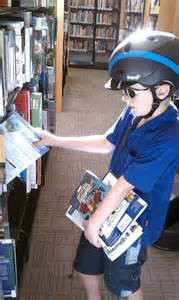 As my kids enter their teen years, I know I will have moments when my parental instincts to protect my children from the world will war with my librarian instincts to protect the freedom to read and to support my children in making their own reading choices. In the meantime, my goal is to draw on my expertise as a teacher librarian, my experiences as a parent, and my research as a scholar to continue supporting readers and their families—mine and yours. Because when we bring all these pieces together to grow strong readers, we also grow our culture, our community, and our country as a whole. Kate Lechtenberg is the professional development chair for the Iowa Association of School Librarians.